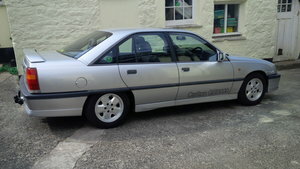 A retro surviving Vauxhall Carlton 2.2i GL (E2) with just 14,851 miles. Phosphated all steel body, safety crumple zones front and rear, rigid passenger safety cell, halogen headlamps, headlamp wash/wipe, bronze tinted glass, laminated windscreen with graduated tint shadeband, key operated power locks, waistline pinstripe, power-assisted steering, electrically operated and heated door mirrors, air blend heater with four speed fan, height adjustable driver’s seat, quartz clock, Philips DC752 stereo cassette, remote electric boot release, courtesy lighting, vanity light, glovebox light, under bonnet lamp. Dealer options; mudflaps. 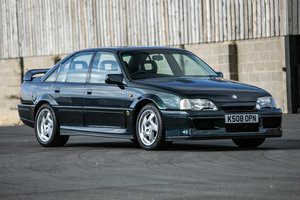 The executive Vauxhall Carlton, the envy of many a Cavalier driver, was a well-equipped and super spacious competitor for the Ford Granada. This exceptional 2.2i GL example has covered an incredible 14,851 miles from new and remains in beautiful original condition. 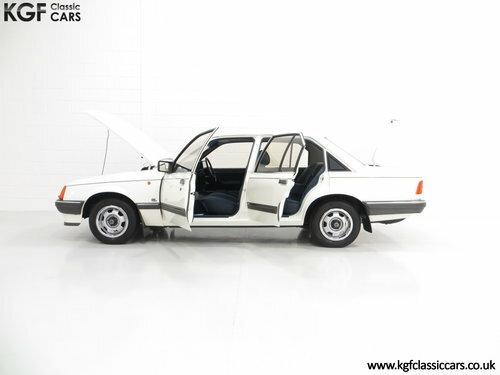 The factory Polar White paintwork, (Code E 452), is preserved in superb order with an excellent uniform finish and all factory panels are pin straight with uniform shut lines. Minor markings can be seen upon close scrutiny including touched in stone chips, most notably to the leading bonnet edge and a tiny ding below the nearside rear lamp cluster. The unique GL badging and waistline pinstripe are fully intact and all other trim sections are immaculate. Front and rear supplying dealer number plates and rear screen sticker still fitted and the headlamp wash/wipe is fully operational! Renowned for excellent build quality, this classic executive Carlton is simply fantastic. A brilliantly period interior, this cabin space will excite and delight fans of 1980’s retro. 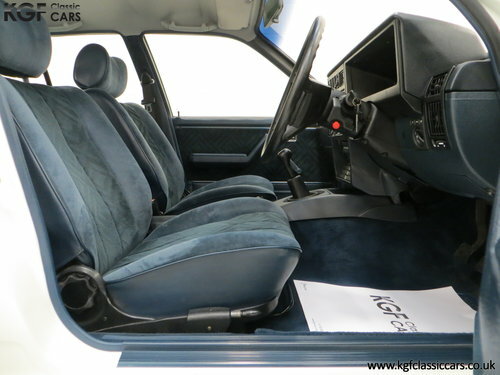 The pristine Blue Viking cloth upholstery, (Code 352), is fabulously plush and preserved in amazing condition with all bolsters and seat bases firm and unworn, commensurate with 14,851 miles. The gloriously angular dashboard is perfect, and all GL functions and controls operate seamlessly, including the original Philips DC752 stereo cassette. Prominent natural veins to the steering wheel and gear knob are an obvious trait of such a low mileage example. With features such as the standard power steering, central locking and electric heated door mirrors along with extensive sound insulation, driver and occupants will enjoy whisper quiet super-saloon comfort, more than capable in modern traffic conditions. Super! The 2197cc cam-in-head four-cylinder engine with Bosch LE-Jetronic fuel injection produces 114bhp at 4800rpm and 182Nm torque at 2800rpm, with marketing literature quoting a 118mph top speed. 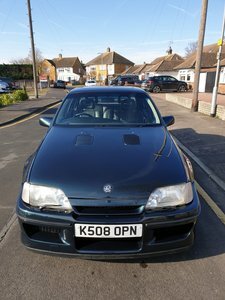 The engine bay is wonderfully clean, unmolested and displays factory plates and stickers as well as factory panel stampings to the inner wings and even PDI dabs, long lost on most examples! The five speed all synchromesh gearbox feels effortless yet sturdy and tight and the clutch action is smooth and light, a real joy to use. The steel wheels are in excellent condition with wheel embellishers and Griffin badged hubcaps all in pristine order. The tyres are matching 175/70 R14 and were fitted brand new in October 2018. Dual circuit brakes with servo assistance feature 9.7in ventilated front discs and 9.1in rear drums to offer ample stopping capability. 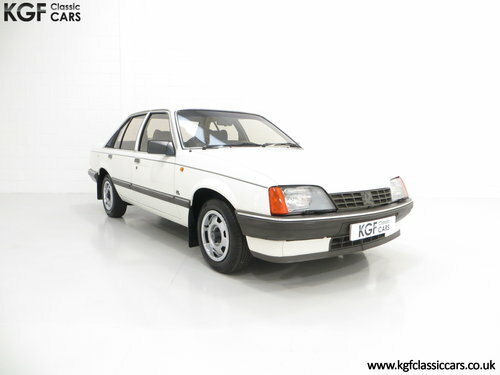 Registered new by Vauxhall Main Dealers, Adams of Tipton, on the 13th June 1986, this exceptional example has covered just 14,851 miles with two former owners. 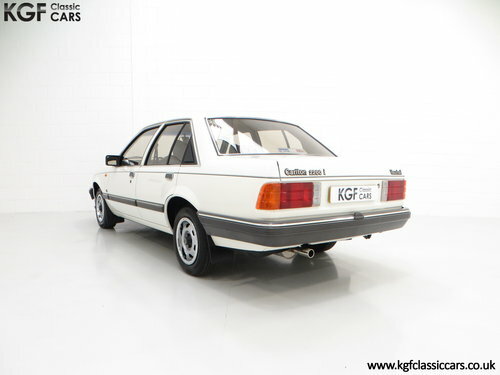 The previous keeper owned the car alongside his collection of 1970’s and 80’s classic cars, including another Carlton, Vauxhall Viceroy, Mk2 Astra and several Cortinas! 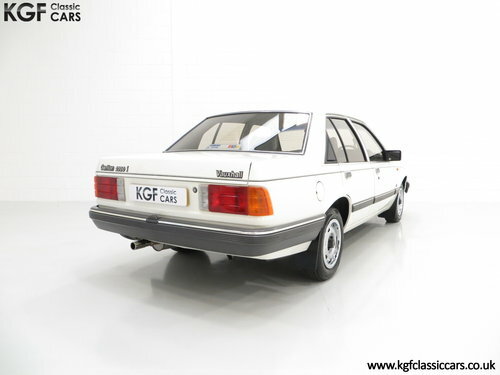 The difficult and reluctant decision to part with this Carlton, the lowest mileage car in his collection, is born from the loss of indoor storage and not wishing to keep the car outside. 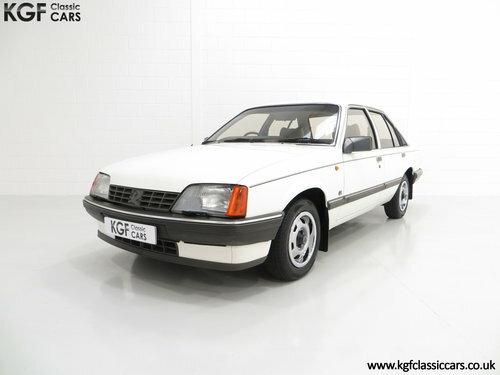 KGF Classic Cars are delighted to be able to enjoy this outstanding example and find the next appreciative owner. The history file contains the original book pack including service booklet, handbooks, radio guides and dealership literature. In October 2018 a full service and inspection was carried out leaving nothing other than driving enjoyment on the list to do! There are two sets of keys and an original Vauxhall range sales brochure from 1985! This fortunate survivor has been preserved as one of the best remaining examples and will delight the next owner in every respect.